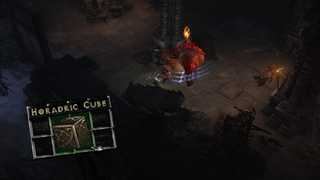 With its unique ability to transmute items into new ones, the Horadric Cube was one of the most useful and iconic items in Diablo II. And while Diablo III had no item like this so far, that will change in an upcoming content patch. Good news! It might mean we no longer have to wear that bloody Ring of Royal Grandeur on every character. This ring has a very powerful passive ability (it reduces the number of items needed for set bonuses by 1—to a minimum of 2) and it’s basically a must for everyone in higher difficulty levels with no real alternative. With Kanai’s Cube, we could just break it down and use its special effect without wearing the ring. There’ll be a few more minor changes in patch 2.3.0, and you can read the whole preview here. One of the most interesting one besides the Cube is the introduction of four new difficulty levels: Torment VII, VIII, IX and X. Sounds crazy!